Click on a city for more information about their use of green infrastructure to manage stormwater! Portland, Oregon is often cited as the prime example for green stormwater management, and with good reason. Portland has one of the most mature and comprehensive green infrastructure programs in the country, with multiple overlapping policies and programs that have seen several iterations over time to become as well established and successful as they are today. In 1977, Portland created a separate stormwater utility fee to help pay for the increasing cost of managing stormwater runoff. In December 2000, the Portland City Council adopted a stormwater discount program called Clean River Rewards to reward ratepayers who keep stormwater from leaving their property. Then, in 2008, the City initiated its 5-year Grey to Green Initiative to improve water and air quality and community livability by installing green infrastructure. As of August 2010, 4.7 acres of green roofs have been installed and 325 green streets have been put in place. EPA and Kansas City, Missouri signed a consent decree in May 2010 which requires the city to use green infrastructure to help control and eliminate sewer overflows. Kansas City will initially implement a green infrastructure plan to control wet weather flows in a 744-acre environmental justice neighborhood, with the option to expand green infrastructure programs throughout the city. Green solutions to be implemented include: catch basin retrofits in road and street rights-of-way, curb extension swales, street trees, permeable pavement, green roofs, and stormwater planters. This agreement will allow the citizens of Kansas City to benefit from improvements in water quality, air quality, and new green spaces throughout the city. Milwaukee created a website to raise awareness in their community about the effects of stormwater on our environment and the steps that one can take to help manage this problem. They require stormwater management plans for private development or redevelopment projects and have also created an Office of Environmental Sustainability that runs the Green Milwaukee program, which is designed to help manage stormwater issues in the city through green infrastructure. This Rooftops to Rivers video (6 minutes) shows how Milwaukee is using green infrastructure to manage stormwater and flooding, create jobs, lower energy costs, beautify neighborhoods, and reduce pollution. Cincinnati’s 2004 Consent Decree to control sewer overflows was amended in 2010, providing opportunities to incorporate green infrastructure solutions by substituting “green for grey” on a project by project basis. The city is currently evaluating potential green infrastructure projects and has a three year study and detailed design period to examine green solutions in the Lick Run Watershed, which is located in Mill Creek Valley on the west side of Cincinnati. One promising project, a corridor that includes an environmental justice community, would remove stormwater from the combined sewer system and create a new above-ground drainage feature with surrounding park land. Cincinnati met with EPA officials throughout 2011 to discuss their green infrastructure plans, and proposals for “green for grey” substitutions are likely to be submitted in 2012. Through an agreement with the EPA filed in 2005 and amended in 2009, Louisville, Kentucky is using green infrastructure to help solve the city’s sewer overflow problems. Louisville has committed to constructing 19 initial green infrastructure demonstration projects including green roofs, green streets, and urban reforestation to keep polluted runoff from entering their waters. After a six-year study period to monitor demonstration projects, the sewer department may propose additional green infrastructure controls. Louisville’s sewer department has already distributed hundreds of rain barrels to residents throughout the city, providing citizens the opportunity to participate in cleaning up their waters. The community at large will continue to benefit from ongoing installment of rain gardens, permeable parking lots, and other green amenities throughout Louisville. 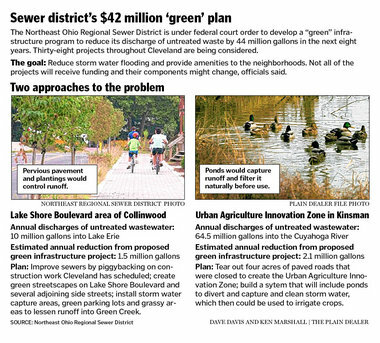 The Consent Decree signed in 2010 in Cleveland, Ohio requires that green infrastructure be used as a part of the solution for cleaning up Cleveland’s waterways. 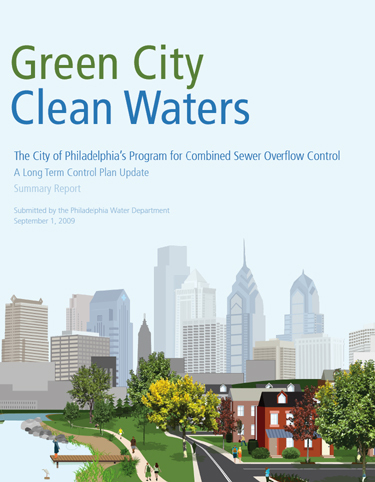 Specifically, green solutions should capture at least 44 million gallons of combined sewer overflow discharge. The city has agreed to conduct a feasibility study, and to spend at least $42 million on green infrastructure projects to meet that reduction requirement. Additionally, the agreement allows Cleveland to submit plans for more green infrastructure controls, based on the results of initial projects. The city plans to target the majority of its green infrastructure projects in low-income and minority concentrated neighborhoods, where there is an abundance of vacant land that can be utilized at a relatively low cost. Cleveland residents will benefit from reduction of sewer overflows and their associated health hazards, increased green space and recreational opportunities, increased property values, and more job opportunities. In 1998, Onondaga County (where Syracuse is located) was placed under an Amended Consent Judgement (ACJ) order to reduce and eliminate the occurrence of CSOs. Onondaga County originally sought to solve its CSO issues solely with grey infrastructure, including the construction of four regional treatment facilities that were opposed by city residents due to their proposed locations and high costs. In 2009, the ACJ was amended to include both grey and green infrastructure approaches, and the county plans to invest $78 million in green infrastructure projects. 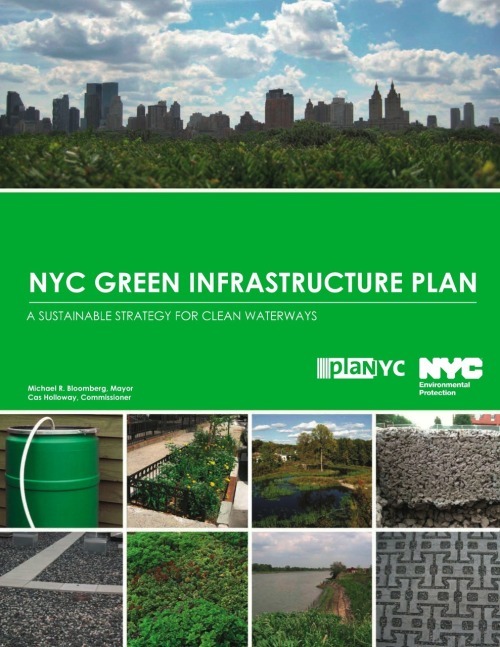 In September 2010, New York City released the NYC Green Infrastructure Plan which presents an alternative approach to improving water quality that integrates green infrastructure, such as bioswales and green roofs, with investments to optimize the existing system and to build targeted, cost-effective traditional grey infrastructure. The joint economic and environmental analysis contained within the plan has shown that the cost of new green infrastructure and more efficient water management systems would save billions of dollars over more traditional fixes. Don’t Flush Me – The idea behind this project is to allow NYC residents to help reduce the amount of pollution in the harbor by understanding when CSOs occur, and reduce their wastewater production before and during an overflow event. In April 2012, the US EPA and Philadelphia Mayor Michael A. Nutter signed an agreement that represents a $2 billion investment in green infrastructure to better manage Philadelphia’s stormwater. Over the next 25 years, the Green City, Clean Waters partnership agreement will transform many of Philadelphia’s traditional grey into green. Because green infrastructure investments make our communities cleaner, healthier, and more attractive places to live and work, this unique federal – city partnership is intended to be a national model for other cities embracing green to follow. The Clean Rivers Project is DC Water’s ongoing 20-year, $2.6 billion program designed to reduce combined sewer overflows into Washington D.C.’s waterways – the Anacostia and Potomac Rivers and Rock Creek. The project, mandated by a 2005 consent decree with the EPA, is a massive infrastructure and support program designed to capture and clean stormwater during heavy rainfalls before it reaches waterways. NRDC Case Study – Using Green Infrastructure to Help Manage Urban Stormwater Challenges in Washington D.C. This 12-minute video from 2010 highlights RiverSmart Homes, a program that was launched in 2006 by the District Department of the Environment as a way to combat the Washington, D.C.’s serious stormwater problems and to actively involve the community in the river’s restoration. Residential properties are the single largest land use in the nation’s capital, and the program actively engages the community in restoring the rivers.